The preserved lemons were the worst thing I have ever tasted. Somewhere between Vick’s Vapor Rub and turpentine. Would never recommend these. I can’t believe that Trader Joe’s would have ever considered carrying these awful things. FYI these aren’t for snacking on. I’m willing to bet you dont eat fresh lemons whole either. Would you eat a whole onion? OTOH, I eat slices straight out of the jar. I’ve always loved lemons and salt. If you like that taste, these are PERFECT. I go through a jar in less than a week. These are the list to try. My ex was Moroccan so I know what to do with them just didn’t think about TJ’s having them. These are best in cooked dishes and are excellent in both a lamb and a chicken tagine recipe I’ve made. These save me the hassle of preserving lemons myself. Hope to try them next with steamed calamari. Thank you TJs! I think these taste like Lemon Pledge, but I am willing to try them in the tangine. Yes, they definitely taste like cleaning product smells. It’s a real hurdle to deal with. I got hooked on them and now my local TJ’s doesn’t carry them. I really liked them chopped up in a salad, on top of grilled meat, or chopped up w. pasta w olive oil & parmesan. Do reduce salt in the rest of your recipe. I LOVE THEM!!! I’d been buying the marinated whole lemons @ Whole Foods(which are way more expensive & not as nicely spiced). Once I found these @ TJ’S…I was hooked. My only problem is they are a seasonal item & I can’t get them year-round. I use them in almost everything in different ways. They’re great on anything Mediterranian/Italian/Asian. they’re also great grilled & then added to the top of any meat or fish. TRADER JOE’S PLEASE BRING THEM BACK FULL TIME??? Tried these last night, they were really good. I don’t rinse them, but I used them in recipes and on other foods. Excellent. We loved them, especially in a chicken recipe of my husband’s. Sadly, our local Trader Joe’s doesn’t carry them any more. Please bring them back! I’m infusing some vodka with them. Should be interesting. I’m very sad they have discontinued them!!!! Is there any other place I can get them? I am, also sad that they have been discontinued. There are two Trader Joe stores in my area and both stores were totally out. I would have bought all they had, but unfortunately there were none at either store. 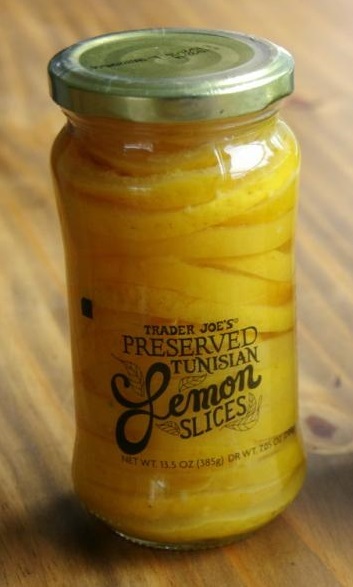 Please, please bring back the preserved lemons. Was perfect in the Moroccan Chickpeas with Chard dish. Please, bring back the preserved lemon, I was using them a lot in my cooking !